Amit Shah publicized that the doors of National Democratic Alliance have been forever closed for Chandrababu Naidu. The National Democratic Alliance that is led by Narendra Modi is soon going to be back and continue to resume its work at the Centre. Chandrababu Naidu was a vital member NDA before he parted his ways in 2018 March. On April 4, the President of the Bharatiya Janta Party, Amit Shah publicized that the doors of National Democratic Alliance have been forever closed for Chandrababu Naidu of Telegu Desam Party. The National Democratic Alliance that is led by Narendra Modi is soon going to be back and continue to resume its work at the Centre. If Chandrababu Naidu of Telegu Desam Party attempts to join the National Democratic Alliance fold, he will not be allowed to enter it as per Amit Shah who was addressing a rally in Andhra Pradesh Guntur district. Chandrababu Naidu was a vital member NDA before he parted his ways in 2018 March over the demand of special category status for the state. The BJP President charged Chandrababu of changing colours whenever it suited him. 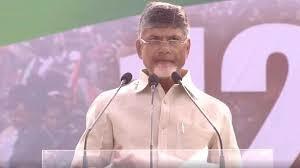 Shah also said that the NDA Government has financially help Andhra Pradesh in the last five years.